At Impact Trophies & Medals, we offer a brilliant range of charity and fundraising trophies, medals and awards suited to any charity event or fundraiser. 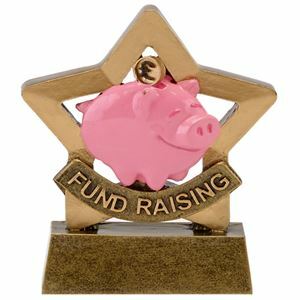 Our extensive range includes piggy bank trophies and star awards for fundraising. Impact Trophies & Medals are a leading retailer of charity and fundraising trophies & awards. Great for personalisation, many of our fundraising trophies and star charity awards can be personalised with free personalised engraved text plates and printed logo inserts, to perfectly meet all your charity and fundraising presentation needs. The Mini Star Fundraising Trophy is a fun gold coloured resin trophy set within a star shaped frame. Set within the star shaped frame stands a pink piggy bank style centre, with a gold pound coin slotting into his back. The Mini Star Fundraising Trophy is glazed for a high quality shine. This stunning award has been UV printed with a high definition, vivid image of the world with two white hands reaching around it. The Mini-Star Charity Acrylic Plaque is formed from a quality acrylic and features a star shaped topper, mounted on a black moulded base. The star is framed by a golden, star printed border and features a red banner over the top reading CHARITY in white lettering. The star and the base come supplied separately, easily clicking together. This Fund Raising Award offers exceptional value for money. Cast from two tone gold resin, the award features a large 3D pound sign sitting upright on a solid rectangular base. The trophy has been varnished for a lustrous finish and would make an ideal award for celebrating business success or for recognising the achievements of a great fundraiser. 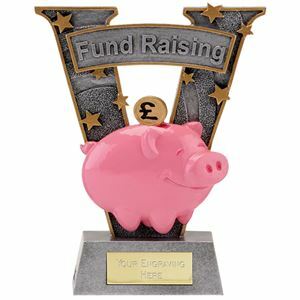 The V Series Fundraising Award is a V shaped silver resin trophy featuring a large pink piggy bank on the front. This fun smiley trophy is decorated with a series of gold stars and a Fund Raising banner. The Heart Suit Cards Trophy would make an excellent prize for any cards game or tournament, or alternatively, the heart design would be appropriate for a range of other uses. The trophy is made from resin in Italy and has been glazed with a durable red lacquer and finished with a silver gilt effect edge. The trophy is presented on a deep base upon which an engraved plate can be applied. This attractive trophy would make a special award for a number of occasions. 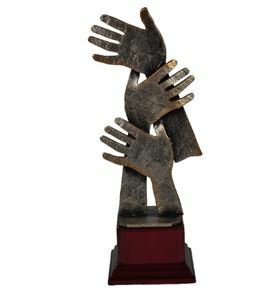 Cast from a premium grade of pewter, the trophy features three hands, clasping each others wrists and is presented on a polished wooden base. From celebrating a notable charity fundraiser to recognising great business achievement, this quality Helping Hands Pewter Trophy can be personalised to suit the requirements of your event and would make an exceptional award for someone special. Stylishly designed and handcrafted by expert trophy makers in Belgium, the Devotion Pewter Trophy is suitable for the celebration or recognition of a religious, charity fund raising, drama or singing performance. 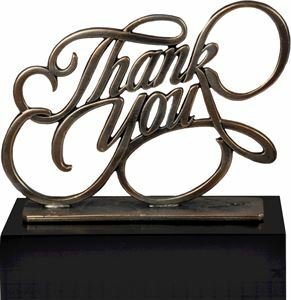 This exquisite award is made from premium pewter, coated in a golden glaze and burnished in white. 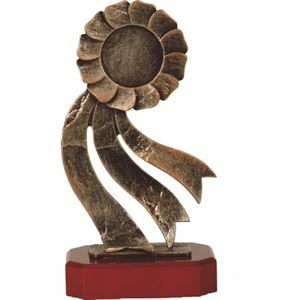 This superior quality award features two stylised soft curved figures with raised arms and are mounted on a black polished wooden base. Stunningly crafted, this exquisite trophy is cast from a premium grade pewter and presented on a polished black block base. 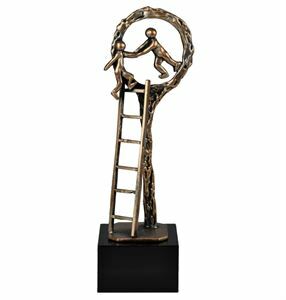 The Ladder to Success Pewter Trophy has been produced in Belgium and forms part of our range of European Designer awards, offering style and quality. The award showcases a tall ladder, leaning against a hoop, with a pair of figures at the top, one helping the other up the ladder and through the hoop. The Belgian made Sandstone Team Work Trophy is handcrafted from superior grade pewter, coated in gold and burnished in a blue copper glaze. 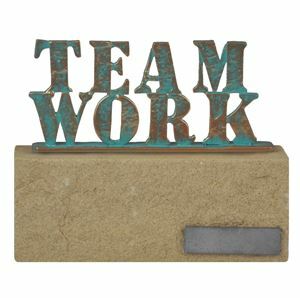 This quality trophy displays the words TEAM WORK in bold font which are mounted on a solid, rough hewn effect sandstone block. 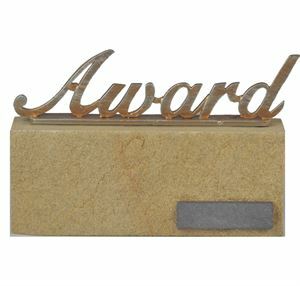 you have the option of personalising the award with the addition of an engraved text plate. 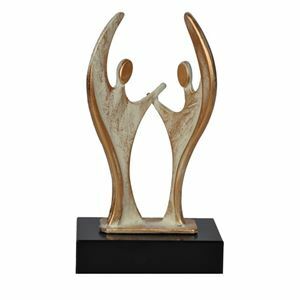 Master craftsmen in Belgium have beautifully designed and scripted, the Sandstone Award Trophy which features the word AWARD. This premium trophy is made from superior grade pewter, burnished in a golden glaze and mounted on a block of natural golden coloured sandstone to create an exceptional award worthy of any prestigious business, academic or charity event.